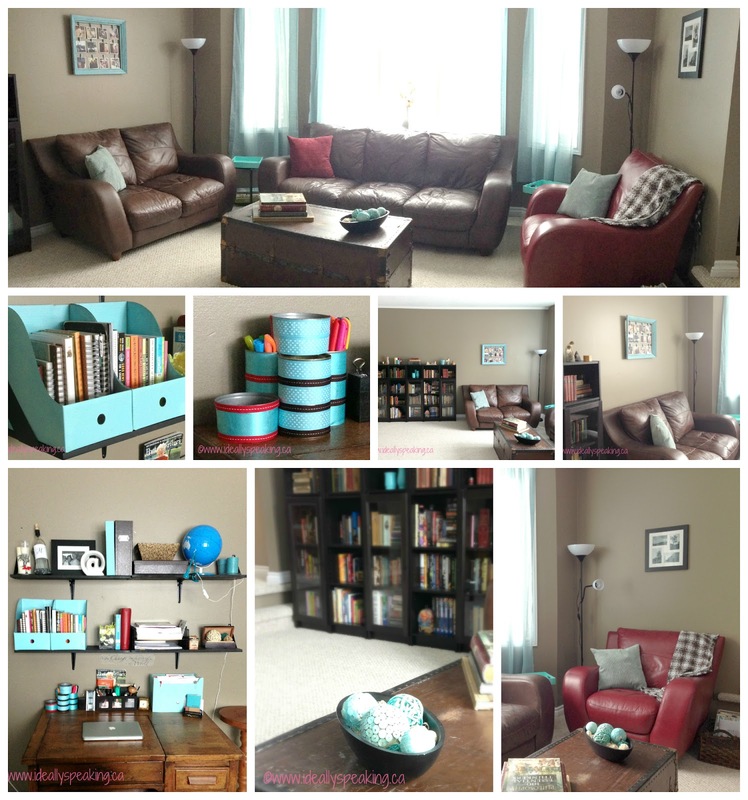 The first installment of The #PinterestHouseProject is here! My study is a home office and library, all rolled into one beautiful room. A room that I always dreamed of having in my home. First up, my crate bookshelf. I’m in love with my crates. The one on the bottom was actually a Christmas gift from my mom when I was just 16. I have to admit, I didn’t actually get this idea from Pinterest. 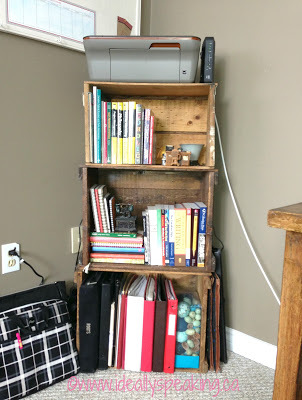 I had crates to use as shelves over 4 years ago, long before Pinterest even existed. 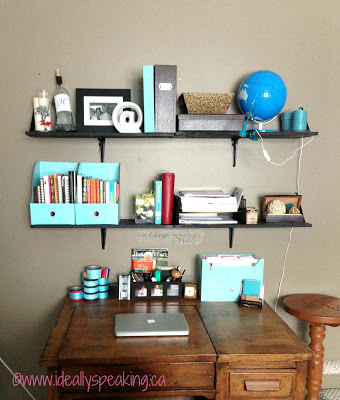 However, I loved when I spotted pictures of the same idea popping up on home decor and DIY boards. It reaffirmed my awesome design style. Here is a great pin of a crate bookshelf that caught my eye. My working area is made up of an antique desk and exposed shelves. 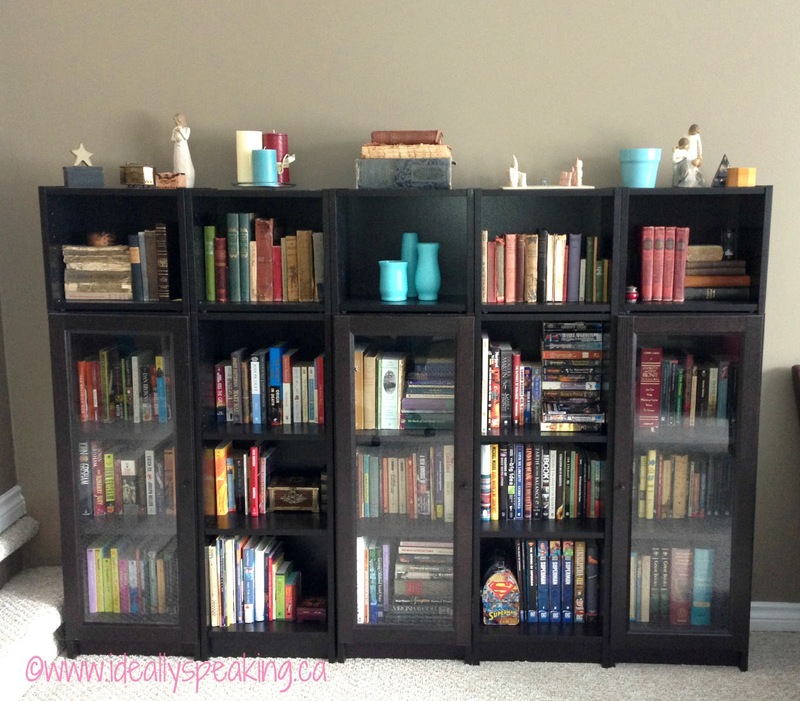 With the shelves visible from the front door, I wanted to ensure that I organized them to look clean & colourful. I purchased a number of Martha Stewart Home Office accessories, including the brown magazine holder on the top shelf, and nearly bought more. 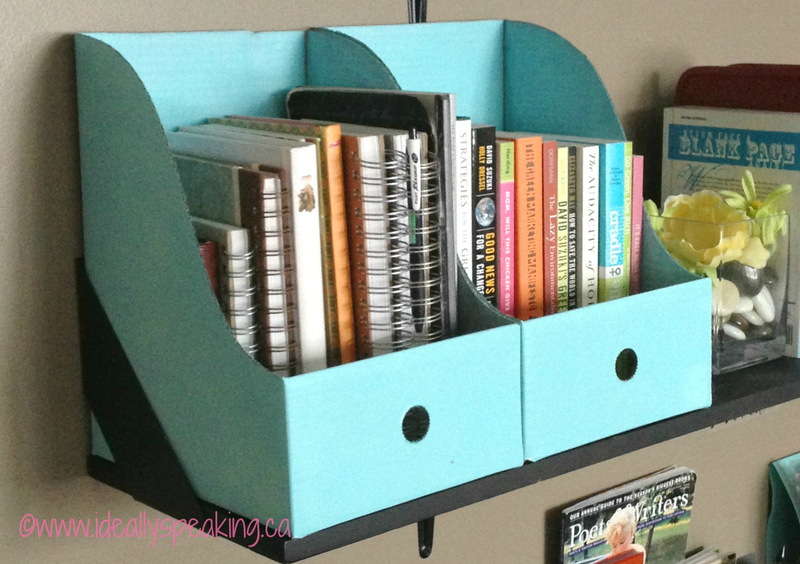 I also found a great tutorial on making my own magazine holder from a cereal box. But I was both cheap and lazy. So I bought a 2 pack of the double sized magazine holders from Staples for under $10 and spray painted them aqua. Done and done. Likewise, I was also cheap when it came to other accessories for my desk. 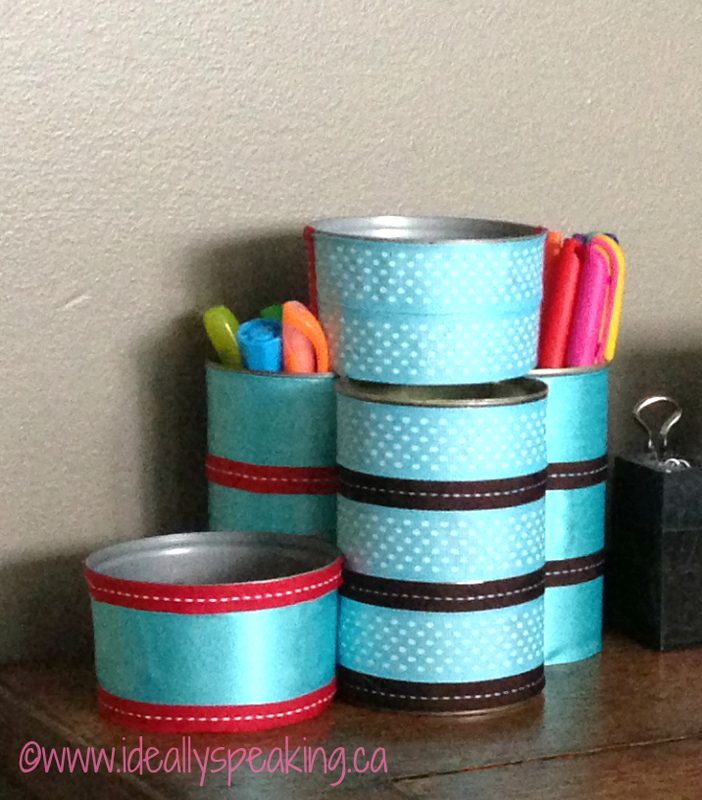 I jumped all over this tutorial for turning recycled cans into a DIY desk organizer. 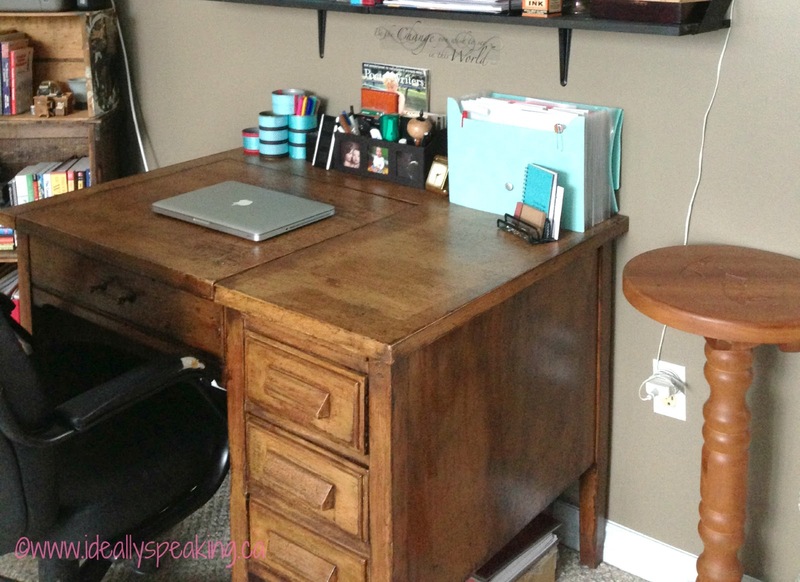 And the gorgeous desk in the center of all this organized beauty? This gem was a find when walking through an old empty century home 4 years ago. I spotted this genuine typerwriter desk (complete with cast iron typerwriter inside) and asked the owner if it was for sale. I took it apart and refinished it piece by piece. Once again, Pinterest wasn’t around at the time, but I do recommend this very detailed tutorial for restoring old furniture. Moving clockwise around the room, we come to my home library. I have just a small collection of books. It’s not an addiction. Not at all. When a bookshelf is this full, it really is just about making it all fit. But I did get some good inspiration on how to make a full bookshelf look organized. My Mama was also sitting in the room while I worked on the bookshelf and gave me pointers about turning some books on their side. This helps to break up some of the blocking that can happen in a full library. 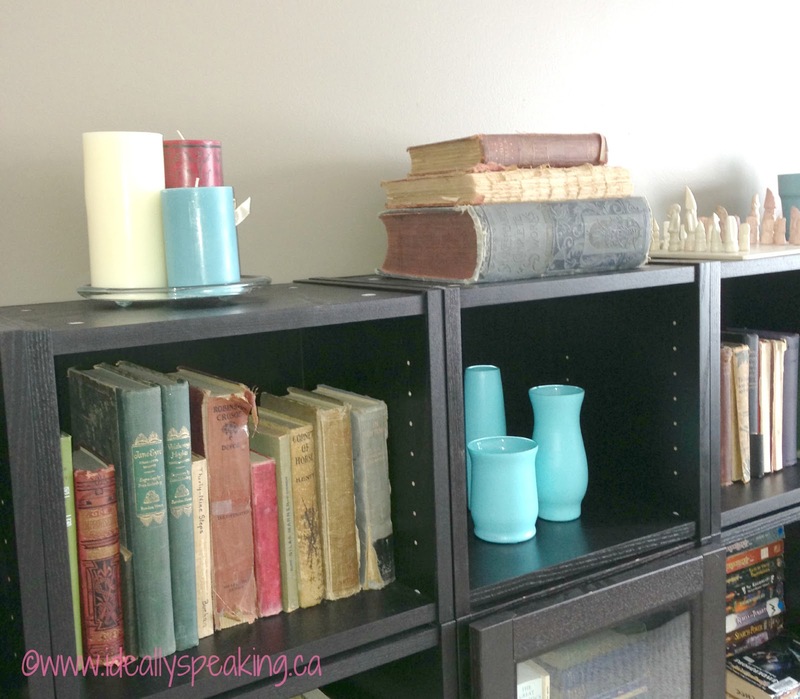 Many of the decorations – old antique books, trinket boxes, candles, etc, – I have had for ages. But I knew I wanted a few vases that blended perfectly with the room. 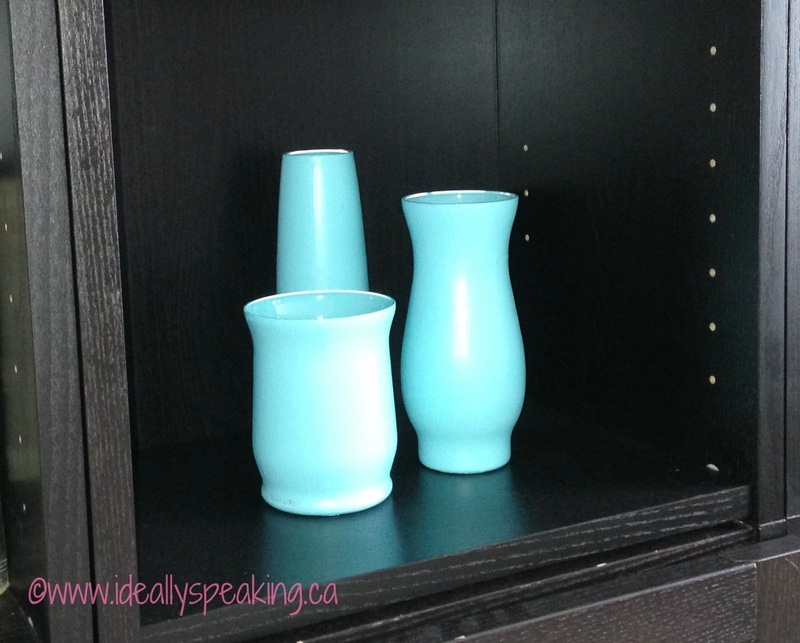 Now, I had intended these vases to look like these beautiful dipped votives, but this was a #PinterestFail. They looked terrible. I am sure it is because I choose glasses that were far too large. Instead, I simply used brushes meant for glass and gently applied multiple layers of acrylic paint to give them a smoother texture. The other half of this very spacious room is used up with a lovely quiet seating area. I wanted something unique and personal above the one loveseat. 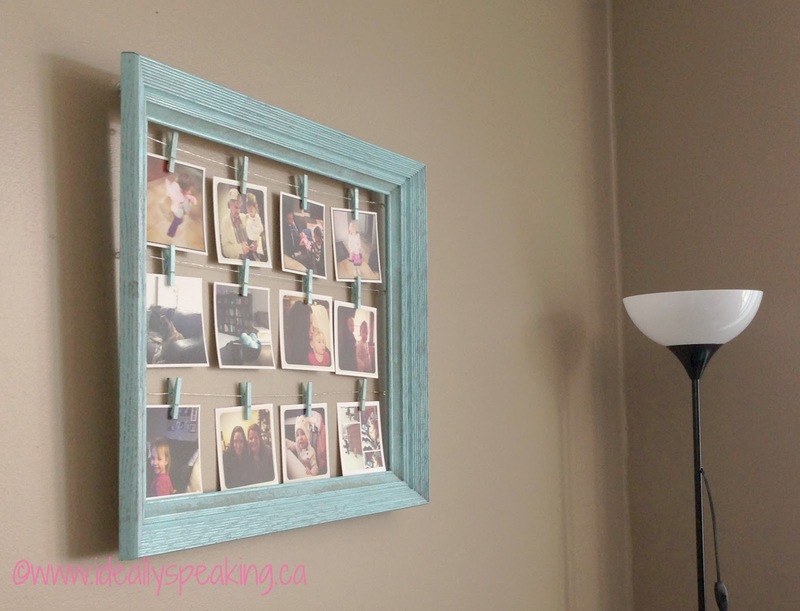 When I spotted this amazing DIY Instagram photo frame, I knew I had found the perfect project. With a huge bay window – one of my favourite features of the whole house – there is a lot of natural light to take advantage of. 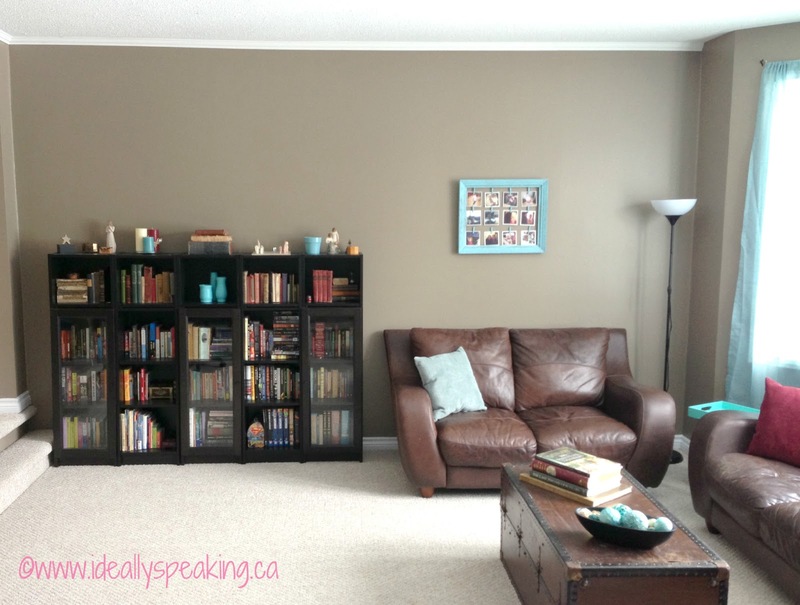 When looking at the overall colour theme in this room, I noticed a growing trend of brown, aqua and red used together. 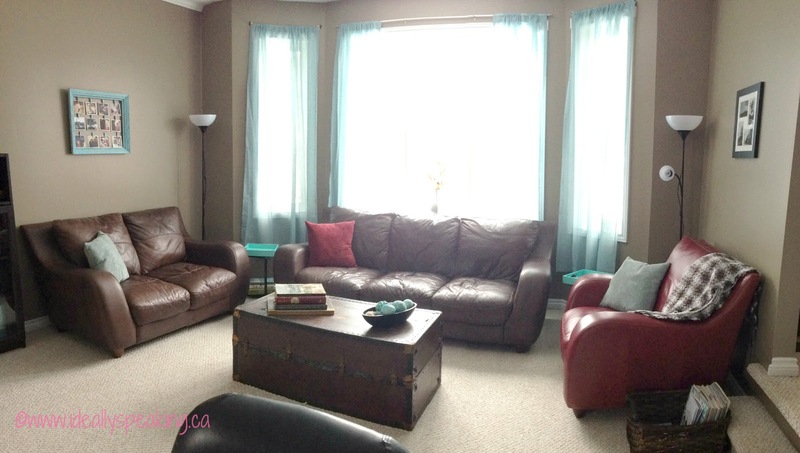 When we bought our leather sofa set, we scored a deal by accepting the chair in a contrasting colour. I love it that way. From there, it was just a matter of accessorizing around it & pulling it into the room. In the end, I gained a creative, warm and inviting space. I think we found a great way to utilize a very spacious and bright room to its full potential. 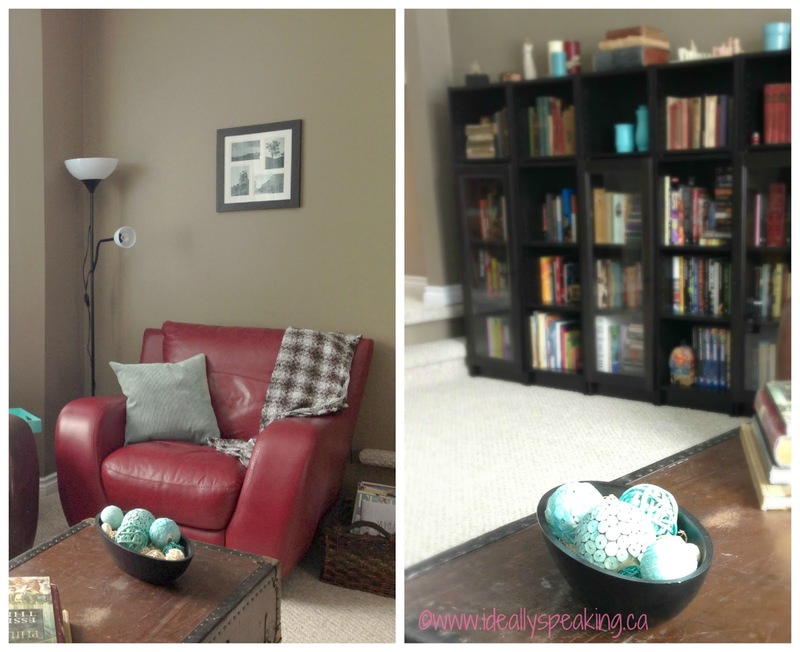 Ideally speaking, every room in my house will be this easy to design and fall in love with. 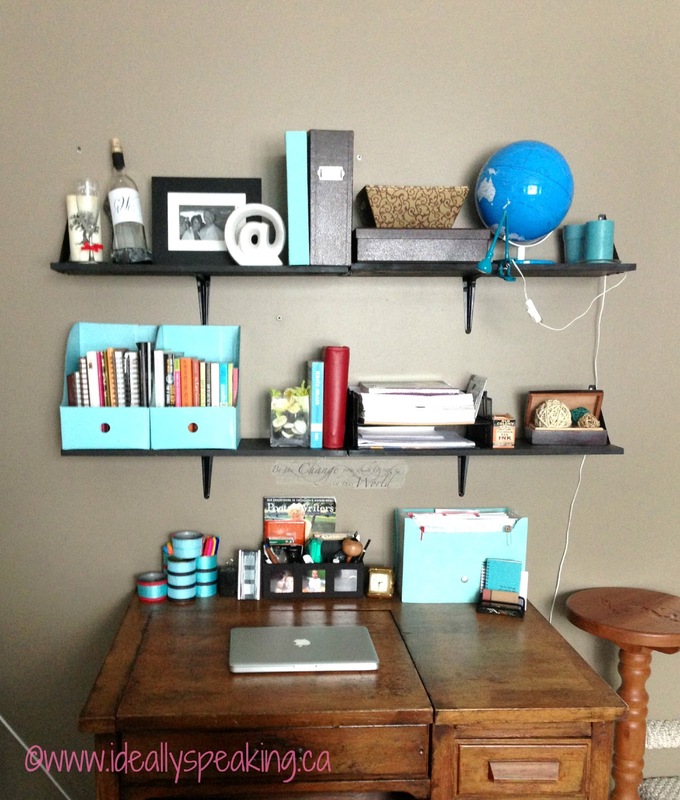 I love the pops of teal blue. The shelving unit is great! Nice space! Thanks for linking up to Talkin’ About Thursday link party. I hope you will come back this week too!